Tall, 30"H x 10"W x 10"D display stand has a shelf at 20" down from the top, so that you can display on the top surface and another item on the lower shelf. 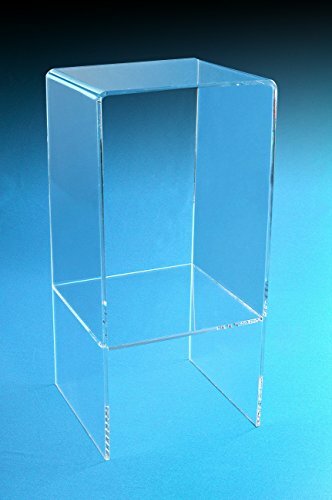 Made of 3/8" thick, heavy, clear acrylic, this is a sturdy stand which also doubles as tall table. Freestanding display holds books, minerals, fossils, and collectibles. Made in the USA. Ships Free to continental states. A versatile table, can be used as a display stand in retail, a tiered plant stand, or in homes as a corner table. Decorative Curved Plate Stand and Art Holder Easel in Gold Finish - 13"